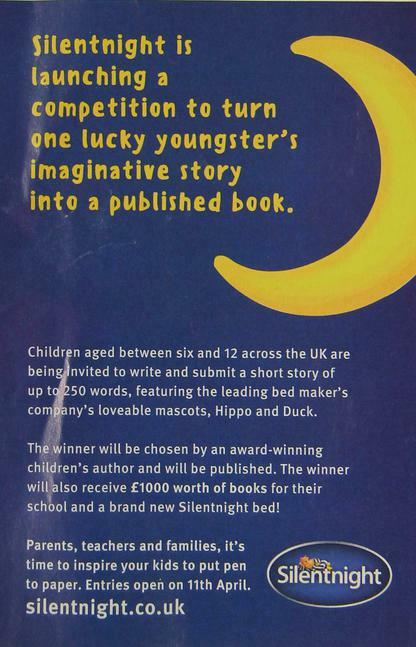 Silentnight is launching a competition to turn one lucky youngster's imaginative story into a published book. The school will win a prize and the author will win a bed! More importantly, it's great fun to write, so have a go and remember to give school a copy so we can display all your wonderful, dreamy stories! Here's a very first attempt from two children. Can you do better? Nancy, time to go to sleep… Goodnight.” Lisped Betsy, the little yellow duck, on the highest of their bunk bed. “Night then Betsy,” snorted Nancy the hippo sleepily. They both shut their eyes and drifted off to the world of their imagination. Loud snoring echoed throughout their little cottage (mainly from Nancy). Minutes later they both opened their little eyes to a world of sugary paradise. Betsy looked her shoulder and was in awe to see her best friend with her in this sweet dream (literally). From pink marshmallow clouds dripped delicious, savoury chocolate rain as gummy bears waddled around lime infused liquorice grass, bubble gum flowers dotted the liquorice grass. Everything was edible, even the gingerbread and gummy bear citizens. It was truly a hungry hippo’s paradise! “ Erm… Betsy… pinch me… is this really happening?” mumbled Nancy in her goofy voice. “I doubt it, maybe we’re in a conjoined dream together!” answered Betsy.